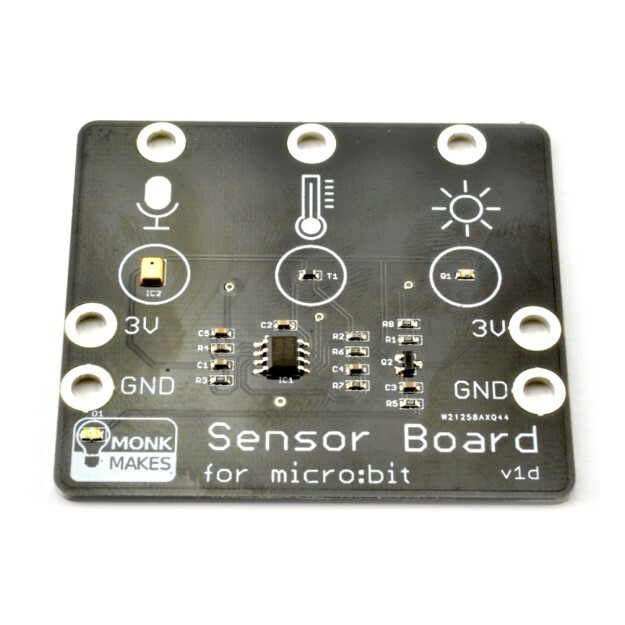 The Monk Makes Sensor Board for MICRO:BIT allows you to sense sound level, temperature and light level. The Sensor for micro:bit uses a MEMs (microphone on a chip) and a pre-amplifier. The output of the sound sensor is connected to an analog input where it can be sampled. The sound signal varies about the 1.5V level. So, silence will produce an analog output of around 1.5V. It uses a thermistor to measure temperature. The temperature output from the board is a voltage that indicates the temperature. This is then measured using an analog input on the micro:bit. If you want your temperatures in Fahrenheit, then multiply the temperature in degrees C by 9, divide the result by 5 and then add 32.